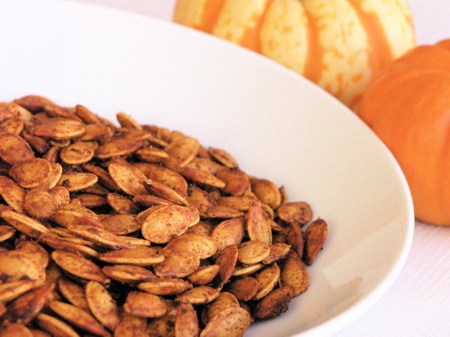 How to Roast Pumpkin Seeds – Crunchy, Spicy and Delicious! I’ve been carving pumpkins all weekend with my kids in preparation for Halloween. I was left with a pile of slimy, thready pumpkin mixture from the inside of the pumpkin and a load of beautiful seeds. Rather than throw these away and waste them, I spiced them up and roasted them in the oven. Twenty minutes later and voila we had a healthy, crunchy and addictive snack! Pumpkin seeds are so nutritious – full of iron, magnesium, fibre, zinc, potassium, omega 3 fats and protein. 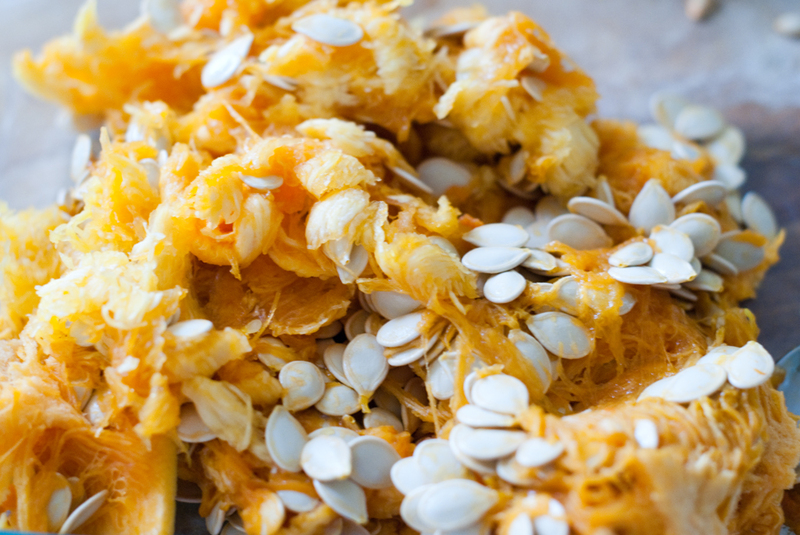 It’s also good to know that the seeds from a sugar pumpkin are tastier than from a regular carving pumpkin but we used our carving pumpkin’s seeds and they tasted pretty good to me. Spices: sea salt, black pepper, 1 tsp cumin and 1/2 tsp cayenne. Or just experiment with any spices you love: oregano, basil, garlic powder, cinnamon, turmeric etc. Spread the pumpkin seeds out onto a baking tray, mix with the olive oil and add all the spices you want. Roast in the oven at 400F for 5-20 minutes, depending on the size of the seeds. Check them and stir them throughout the cooking time. Be careful not to burn them as this can happen very easily!